In the corner of the barn a 125-year old threshing machine chugs through a load of wheat, separating the heavier grains from their dry casings of chaff, which float out through the open door into the yard. The motor was fitted some time in the 1960s to substitute for hand labour, the wood construction has been cleaned and patched up, and a few improvements to funnels, chutes and flaps have been engineered from plastic, but this machine that plays its part in turning wheat in the field to flour in the bags sold onboard the VegVan, is doing pretty much the same thing it has done for more than a century. Elsewhere in the small barn, illuminated by daylight filtering through the corrugated clear-plastic roof, there is a novel arrangement for drying grains before they go into the thresher. Priced out by the high cost of industrial-scale equipment, this small farm – miniscule by comparison to many, with only 25 hectares of grains under the plough – has adopted a hoover-based solution. A domestic vacuum cleaner sits atop a pile of grains pumping air through tubes percolating into its depths. Moving past piled 25kg commercial sacks of flours and behind a plastic curtain into the tiny milling room, a French stone mill and curiously vibrating flour-sifting device take us further towards the finished product, examples of which are neatly lined up in crisp white paper bags on the shelf, waiting to be labelled. 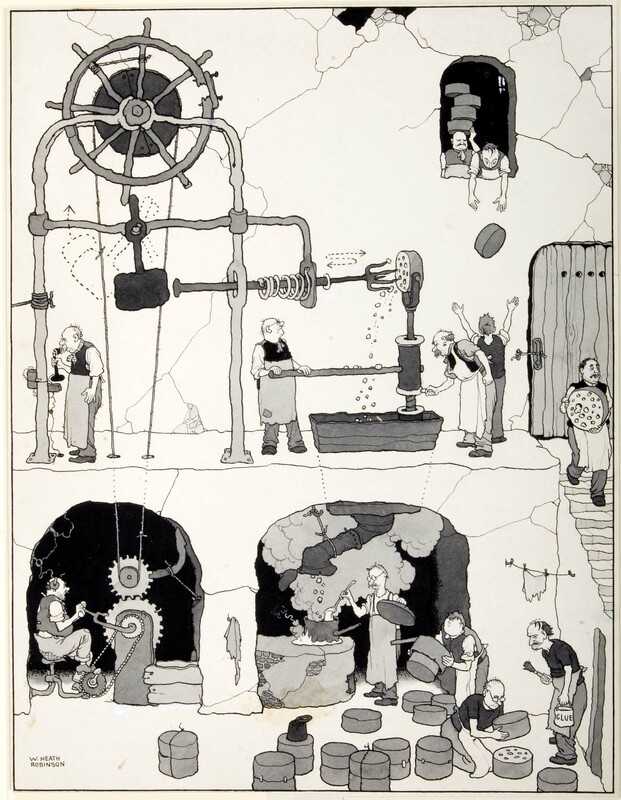 It is easy to invoke the spirit of Heath Robinson – the cartoonist known for his drawings of wildly eccentric machines with complex systems of levers and pulleys held together with bits of string – but the Heritage Harvest farm run by John Letts is something altogether more interesting and more serious. This is a palace of technological ingenuity, cobbled from simple and archaic devices, but get John talking and it becomes clear that this is also an agricultural research station attempting the reimagining of the industrial logics of modern food production. It just so happens that we also get a damn tasty bag of flour out of the process. For many years John has been researching European heritage grains, as an archeobotanist, thatcher, baker and farmer, and he has grown many plots of biodiverse ancient wheat on other people’s land, but this is the first time he has had his own farm and processing facilities to play with, less than an hour from Oxford. He is farming here in the same way as billions of smallscale farmers worldwide, through knowledge-intensive practices that must continually respond to changing local ecological and economic conditions. He is doing things that “shouldn’t” be done – growing diverse mixtures of weird grains that pre-existed the modern varieties by centuries, planting at the wrong time of year, testing the accepted wisdom on crop rotations, processing and milling on site, and occasionally scaring his customers with a handy demonstration jar of ergot, a potentially deadly psychedelic fungus that he takes pains to ensure never contaminates his rye crop… – in the belief that our industrial agricultural techniques are a blind alley that will ultimately do little to serve sustainable human well-being. You can read a lot more about John and Heritage Harvest elsewhere on the web so we won’t go into the full story here. Suffice to say he makes a great pizza, should you end up visiting the farm. Pioneers of agroecology face an economic challenge. Most of the UK’s agricultural research stations have been closed down over the past few decades, and funding for agricultural research is biased towards industrial production, much of it coming from the big multinational biotech and agro-industry corporations. For better or for worse, these experiments have to ultimately aim towards self-sufficiency, in an environment that does not bathe smallscale agricultural enterprises in rays of financial sunlight. Looking behind the scenes there’s a lot of magic involved – financial support from supportive philanthropists, a grant from the Prince of Wales, a lucky break finding land and buildings on a former dairy farm. And most recently there has been a partnership with a London bakery that will use tonnes of flour to bake a range of sourdough heritage loaves. Cultivate is the only outlet in Oxford at the moment where you can buy Heritage Harvest flour – we sell retail bags of organic certified white, wholemeal, spelt, rye and maslin (mixed wheat and rye for sourdough)* for the very reasonable rate of £2.75, with several lines currently on special offer at reduced price! This is THE best stuff to use for all kinds of high-quality, healthy baking, especially sourdough, with the added knowledge that you are supporting unique research and practical innovation for a more diverse food system. Come and get it! *We don’t always have everything in stock all of the time, so feel free to drop us an email if you want to make sure we have what you’re looking for.